Atheneum Books for Young Readers, 9781416994671, 40pp. 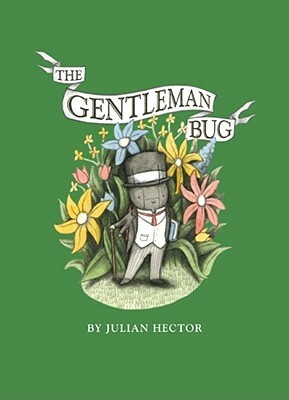 The Gentleman Bug is perfectly content leading his quiet life in the garden as a school teacher and bookworm. He doesn't even mind the ceaseless teasing of the more dapper bugs. But everything changes when the Lady Bug arrives in town. The Gentleman Bug falls legs over antennae for her at first sight. But how will he get her to notice him? After a series of mishaps and a failed Victorian makeover, the Gentleman Bug learns that love (and a love of literature) trumps all, as he wins his fair Librarian Lady Bug's heart. Author-illustrator Julian Hector was born in Los Angeles, grew up in rural Texas, and graduated from Parsons the New School for Design in New York City. His debut picture book, The Little Matador, was published in 2008. Julian lives in Guthrie, Oklahoma, and you can visit him online at www.julianhector.com.